In a data center the delicate balance of performing mission critical tasks, storing and protecting information, maximizing uptime and also being energy efficient all happen simultaneously. Today clients demand their information systems to run effectively and run efficiently, and they demand them to be in use whenever they want them there. Data centers must continue to look at ways to avoid power failures and maximize efficiency through an effective monitoring plan and a reliable UPS. Proper redundancy to maximize uptime can be costly and drain a lot of energy. But, without proper redundancy, a data center could experience catastrophic downtime. The correct Uninterruptible Power Supply, UPS battery and monitoring must be in place to prevent problematic power failures from occurring. 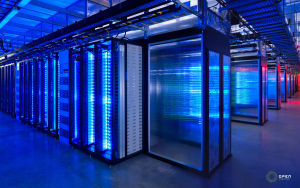 There are many emerging trends in data center Uninterruptible Power Supply systems and management. Major facilities are looking at ways to reduce power supply needs by implementing data networks so that, if a power outage occurs, data demands can be shifted from one server to another until uptime is restored. Data Center Knowledge explains how, and why, big facilities are making a shift away from traditional UPS systems and UPS batteries to improve efficiency while maintaining and maximizing uptime, “Big uninterruptible power supply cabinets and rows of batteries that are similar in size to the ones under the hood of your car have been an unquestioned data center mainstay for years. This infrastructure is what ensures servers keep running between the time the utility power feed goes down and backup generators get a chance to start and stabilize. But companies that operate some of the world’s largest data centers – companies like Microsoft, Facebook, or Google – are in the habit of questioning just such mainstays. At their scale, even incremental efficiency improvements translate into millions upon millions of dollars saved, but something like being able to shave 150,000 square feet off the size of a facility or improve the Power Usage Effectiveness rating by north of 15 percent has substantial impact on the bottom line. Those are the kinds of efficiency improvements Microsoft claims to have achieved by rethinking (and finally rejecting) the very idea of the big central stand-alone data center UPS system. The company now builds what essentially is a mini-UPS directly into each server chassis – an approach it has dubbed Local Energy Storage… It saves physical space (150,000 square feet for a typical 25-megawatt data center, according to Shaun Harris, director of engineering for cloud server infrastructure at Microsoft, who blogged about LES this week). It is also more energy efficient, because it avoids double conversion electricity goes through in a traditional data center UPS. Finally, Microsoft saves by not adding reserve UPS systems (in case the primary ones fail) and by not having to build a “safety margin” in the primary UPS. Data center designers usually go through a lot of trouble to make sure the central UPS plant doesn’t fail, because if it does, every server downstream will go down when the utility feed fails.” The need for an effective and efficient UPS is not going anywhere anytime soon, especially not for smaller locations that cannot rely on implementing a network of data sites. Ensuring that your facility batteries and backup power supply are not only sufficient for your data center but are actually being monitored and will work if needed are critical steps in the process to maximizing uptime in the event of a power failure. This entry was posted in Back-up Power Industry, Data Center Battery, data center equipment, Data Center Infrastructure Management, DCIM, Uninterruptible Power Supply, UPS Maintenance and tagged Uninterruptible Power Supply, Uninterruptible Power Systems, UPS, UPS Batteries, UPS maintenance, UPS Systems. Bookmark the permalink.